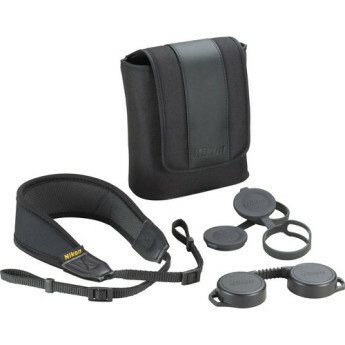 Lowest Price Online: $476.95 ? 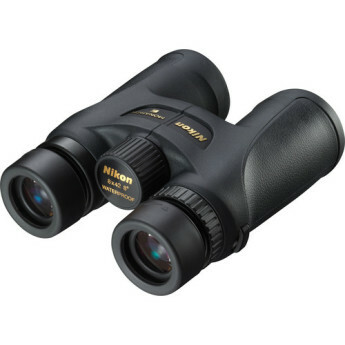 Box Dimensions (LxWxH) 7.1 x 6.6 x 4.2"
The Nikon company has lately swamped us with new roof prism binoculars. After launching the top-of-the-range EDG series they added Sporter EX, Prostaff 5, Prostaff 7, Monarch 5 and Monarch 7 as well. handy casing,, huge field of view,, good transmission,, well-corrected chromatic aberration,, moderate astigmatism,, sensibly corrected distortion,, good whiteness rendering,, high quality of prisms and coatings,, clean and black inside the tubes. too high coma,, the casing made a bit carelessly,, slightly egg-shaped exit pupils. I bought a pair of the 8X42 Monarch 7's some time back and have been pleased with them. When the opportunity (i.e. 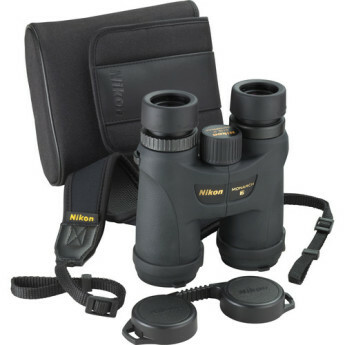 a monetary windfall) arose to get "the best" binoculars, I compared them to top-of-the-line Leica and Swarovski models. 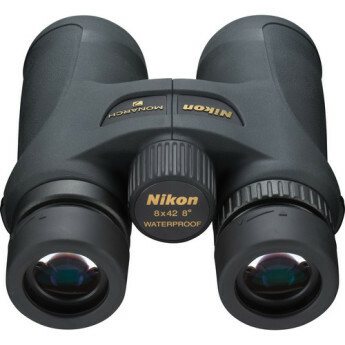 These binoculars are a replacement for 10 x 42 binoculars that were bright and sharp in the center but whose image quality fell off quickly moving away from the center. 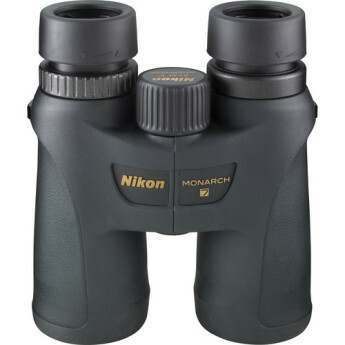 These Nikons have slightly less magnification but the entire field of view is clean and sharp. Good quality construction. Clear and crisp images. Some blurriness around edge. Focus wheel is smooth and easy to use. For the price they are a great value. Very good optics. Sharp across the frame. Focusing for the first time on right ocular was extremely stiff. With repeated use, focusing is less difficult. Focus ring is still difficult to turn but seems to have improved with repeated use. Excellent salesman who listened to my needs, offered a less expensive alternative, and let me sell myself on the Monarch 7's! Bought these for faunic watching from the house since we live in a wooden area and enjoy frequent visitors of many species. We also owned a pair of 8x40 by Bushnell for a few decades. 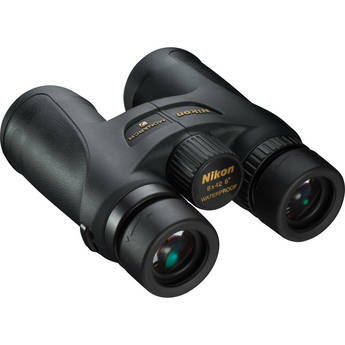 1st pair of quality binoculars so I've nothing to compare them with. in saying that they are excellent. The quality and field of view are brilliant, really crisp image and on close up viewing it seems nearly better than ur own eye sight. So glad I chose the 10x over 8x. Bought these for use while walking the Welsh uplands. Couldn't be happier. The clarity is breath taking and makes their use a real joy. Even at night they seem to make vision clearer as everything just becomes so crisp and sharp. They are waterproof so no worries over the British rainy weather. I won't write a lengthy review about these bins and how awesome they are as many people have done that before me. I will echo those sentiments, however.